I have done weekend trips in Michigan, in addition to a five-month section hike on the Appalachian Trail in 2007. After this I moved to Portland, and frequently hike in the Columbia River Gorge and the Oregon and Washington Cascades. I generally do day hikes, and weekend overnighters, with 5-15 lbs (2.3 - 6.8 kg), but carry 25-30 lbs (11.3 - 13.6 kg) on multi-day trips. I enjoy doing steep climbs, 2000-5000 ft (600 - 1500 m). I started winter hiking with traction devices, snowshoeing, and will be taking a basic mountaineering course in spring 2009. This a lightweight, full zip, hooded fleece made of Polartec� Wind Pro� with Hardface� Technology. This hoody has a very minimalist design. The fleece itself is very thin. It is a form-fitting cut fleece with two hand zips, a soft-chin guard, scuba-style hood, and a short waist. The sleeve cuffs, bottom, and hood all have piping at their edges. 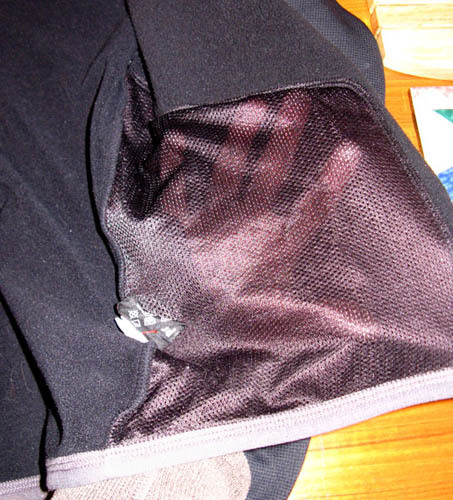 The two front hand zip pockets have mesh backs. Polartec� Wind Pro� is a form of fleece that better blocks wind, and Hardface Technology is a "finish" on the fleece that gives it a smoothed, snag-resistant property. Close inspection reveals a micro-waffle-like texture. Arc'teryx states that the Fugitive Hoody has mild water repellency. It is not clarified if this is from the Hardface Technology or a DWR (Durable Water Repellent). 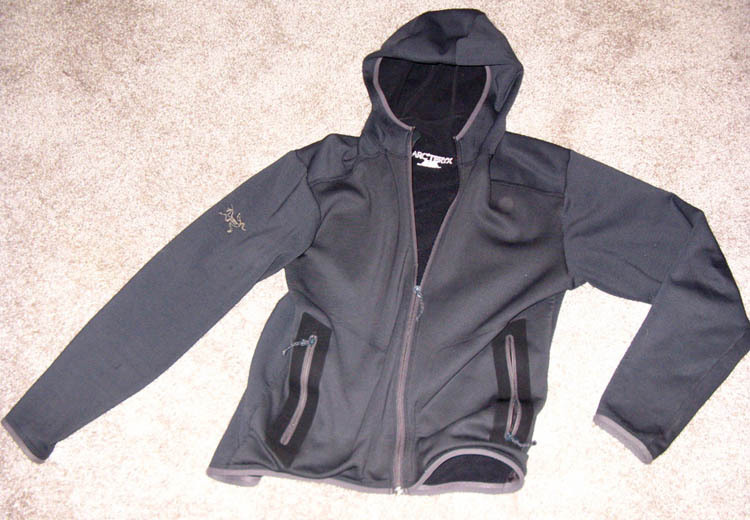 Arc'Teryx also sells a women's version of this Hoody, which is available in different colors. 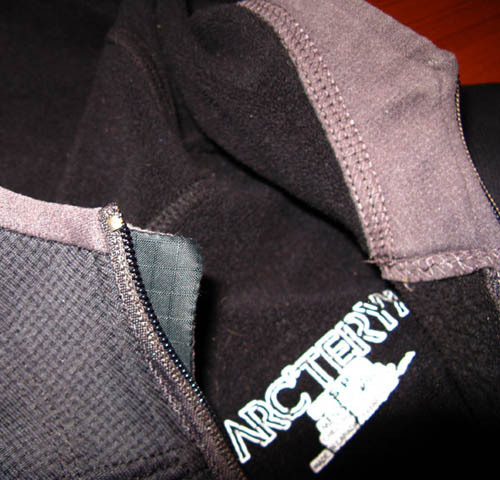 This hoody was originally purchased to use both in urban and backcountry settings. 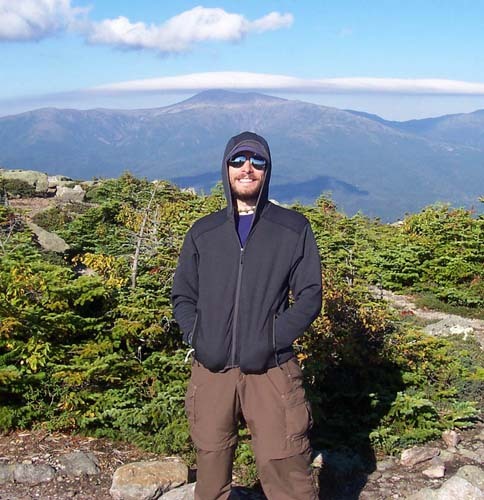 This hoody has been used in Michigan, Oregon, and along the Appalachian Trail. I have used the Fugitive Hoody in all four seasons. In the heat of summer it has been worn without a t-shirt underneath, and in the dead of winter I have used it as a 3rd layer, and under a 4th layer. I can verify it has been worn (with and without layers) in a temperature range of 18 to 80 F (-8 to 27 C). For use on the Appalachian Trail, this was my main 'warmth' option while in camp and for hiking when it was cool or cold. I also used it on a few occasions for bug protection when it was warm out. It was frequently used as a pillow, as well. The Fugitive Hoody was very functional for these uses for a variety of reasons. First of all, at 15.5 oz (440 gm) it was relatively light. Second, it was very compressible, taking up a small volume for a fleece. Third, as it is form-fitting, very thin material, it was also highly breathable, with superior wicking properties, which allowed me to wear it with a backpack on. Fourth, it had mild water repellency, suitable for very light rain or mist, the "after" rain that drops from trees long after showers have stopped, and dew or rain that one may come into contact with when pushing through brush, trees, or tall fields. Fifth, it is very soft! It felt good on bare skin and it rode over layers very well. Sixth, and finally, it dried very quickly. This versatility allowed the Fugitive to work well over a wide temperature range, as at warmer temperatures with more sweating, it breathed, wicked, and dried quickly and at colder temperatures still performed these tasks, but at the same time provided necessary warmth. I found its use to be excellent for the situations when it was mildly wet and cool out, yet a full rain coat was overkill. It is also worth noting that after multiple days on the Appalachian Trail without a shower, this hoody did not seem to hold body odors very much. I have found some synthetic materials to reek of body odor after a short time of wear, but this is not one of those items. The water repellency is not something I would depend upon in continued exposure to rain, snow, or heavy mist. It is sufficient for short durations of these types of precipitation, if they are light. That said, under light conditions, the water repellency works great, water does bead up and roll off the Fugitive Hoody. Wind protection is also light, but better than a regular fleece. However, in any significant wind, other options would probably be desired, as a moderate wind easily cuts through it. I will provide more details on its wind blocking properties in the next paragraph when I describe its winter use. In Oregon I have used this Hoody similarly to how I used it on the Appalachian Trail, with the addition of winter use. As a third layer winter use, above a silk/fine merino base layer and a Patagonia Capilene 3 mid-layer, it has performed great during snowshoeing. Its wicking, fast-drying properties make it excellent for warmth for wintertime aerobic activity. I especially enjoy using the hood for basic neck, head, ears, and chin wind protection and warmth. That said, when I have stopped snowshoeing for a few minutes, the Fugitive Hoody does relatively little to stop a cold winter wind. So, while this lack of windproofing is great while aerobically snowshoeing and sweating a lot, it is not when stopped in cold temperatures. The impact of changing from this "wind blocking" to a nearly "wind proof" shell was stark. However, I do not consider this to be a weakness of the Hoody, as it is a light hoody and never intended as a serious winter shell. I have used it as a third layer with a heavy winter fourth layer, though that was for warm only, and I think its thinness was more of an asset in gaining warmth with 4 layers, than was its actual warmth/insulating properties. One caveat I have found with winter use that I do not encounter during other seasons is that the zipper is difficult to operate when using heavy gloves. Getting the zipper going is fine, but getting it zipped up to below the chin with one hand is nearly impossible. 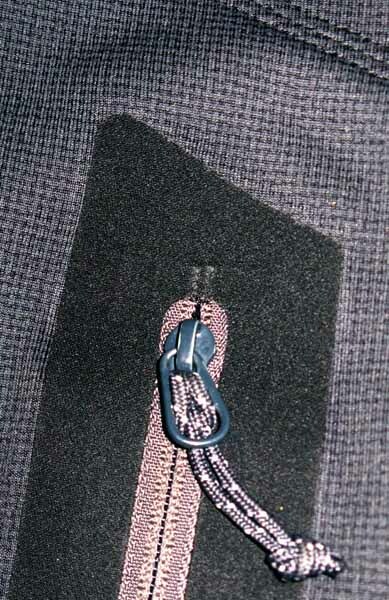 The small chin-guard of brushed, very soft fleece seems to get hung up on the zipper at the top. I have had to use both hands to get the zipper zipped to the top. I do not believe I encountered this in other seasons because I have rarely felt the need to zip it to the very top. Worthy of note about the "Hardface Technology" is that after close to 1000 miles (1600 km) of wear, it has few, if any snags or pilling in the material. I have not hesitated to run, creep, or stomp through brush with the Fugitive Hoody because it does not pill, snag, rip, or get stretched out. The construction is superior, with welded seams, and after lots of hard use, there are no loose threads, frayed areas, or worn spots. The Arc'Teryx Fugitive Hoody is a lightweight, wicking, light wind and water repellent full-zip hooded fleece. It has minimalist design, and a form-fitting cut. It can be used over a wide range of temperatures and conditions. It seems quite impervious to rips, snags, or stretching from underbrush, sharp or rough rocks, or backpack strap rubbing. The thinness and lightness of the Hoody allows it to be compressed in a pack, or worn without being too bulky with a backpack on. Minimalist design (there are no features to fool with or to break). Polartec WindPro in this hoody only provides minimal to light wind protection, though the water repellency seems satisfactory given the material.